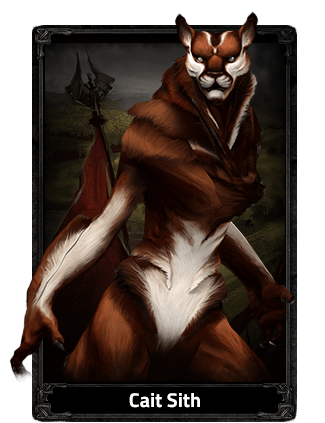 Cait Sith is a playable Races in Camelot Unchained. The Veilstorms changed felines forever. Lithe but powerful, the Cait Sith are fiercely unforgiving in their defense of themselves or their kin when threatened. They distrust most other races deeply, and mockingly call them the Furless. Blessed with incredible memories and a sarcastic streak, each member of the Cait Sith is an historian, able to recall events from long ago with a dry wit. The Cait Sith are fanatical in their devotion to a cause, and recall with gratitude how Arthur was willing to sacrifice himself to save a member of their race. In return, they would lay down their lives for King Arthur, and call it an honor.